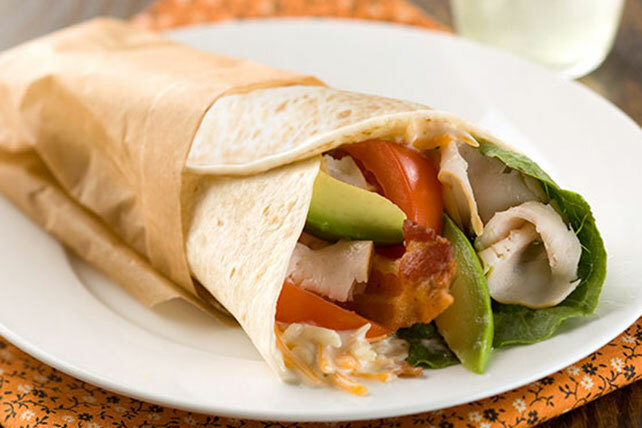 These Classic Cobb Wraps are great options for packed lunches or picnics. They're easy to make and incredibly delicious! Combine dressing and cheese; spread onto tortillas. Top with remaining ingredients; roll up tightly. Serve with assorted cut-up fresh vegetables and a piece of your favorite fruit. To make tortillas easier to roll and avoid cracking, wrap them in paper towels. Microwave on HIGH 30 sec. or just until warmed. Too much moisture can make tortillas soggy, so pat greens dry with a clean kitchen towel after draining or use a salad spinner.